On May 9th., 2013, humanity reached new heights. But not a high we can be proud of. The American National Oceanograhic and Atmospheric Administration (NOAA) announced that the 400 parts per million mark for atmospheric CO2 had been passed at it’s Mauna Loa Observatory in Hawaii. The Mauna Loa Observatory (MLO) is a premier atmospheric research facility that has been continuously monitoring and collecting data related to atmospheric change since the 1950’s, including CO2 levels. 800,000 Years of Atmospheric CO2 Levels In Three Minutes. 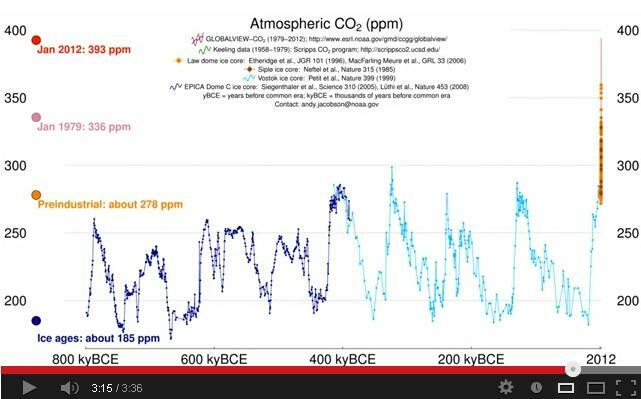 Spend 3 minutes to watch 800,000 years of atmospheric CO2 concentrations. it’s an approach we would do well to take. On that basis, our generation has borrowed the Earth from our children and grandchildren, and we’re handing it on in a dirty, degraded and damaged condition. Kevin Rudd may have forgotten that “Climate change is the greatest moral challenge of our time” after he became Prime Minister in 2007, but it still is. Mendacious corporate interests, biased media proprietors, spineless politicians and sadly gullible deniers have swung public opinion against the reality of climate change, even as the scientific evidence continues to pile up. Me and You, and CO2- What the Heck Are We Gonna Do? All I can say is that each of us who are prepared to examine and accept what the experts tell us on climate change (and there’s a more than a 93% consensus amongst climate scientists), need to take every opportunity we can to influence media, candidates and voters in the leadup to the September election.